SPIDER-MAN: INTO THE SPIDER-VERSE introduces Brooklyn teen Miles Morales, and the limitless possibilities of the Spider-Verse, where more than one can wear the iconic mask. If you haven’t seen this extraordinary, Academy Award winning film yet, now is your chance. 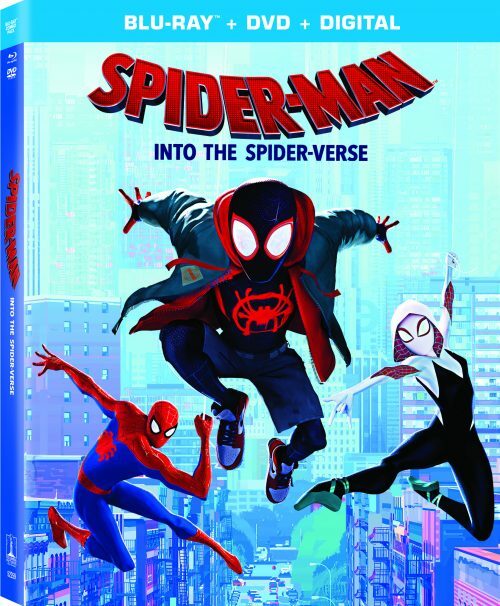 I’ve got my SPIDER-MAN: INTO THE SPIDER-VERSE movie review for you here, and the film is now available on Blu-ray, DVD, 4k Ultra and Digital. I love this movie, and you’ll see how much in this SPIDER-MAN: INTO THE SPIDER-VERSE movie review. It’s a movie that your entire family can enjoy together. It’s rated PG for frenetic sequences of animated action violence, thematic elements, and mild language. It explores such themes as family, friendship, good vs. evil, disappointment, joy and sadness as well as others. The film begins with Miles Morales, a typical teenage boy, heading to school. But this isn’t just any school. Miles now goes to an elite private school thanks to his academic achievements as well as the luck of the draw. He’s only been attending for a short time, and he’s not crazy about the fact that he’s got to stay in a dorm during the week, away from his family. Thankfully, his Uncle Aaron lives in the neighborhood, and Miles sneaks out to see him occasionally. His uncle is the only one who understands Miles’ love of art. One night Uncle Aaron takes Miles to an abandoned subway station where Miles can create to his heart’s content. While there, something happens that changes Miles’ life forever. You guessed it! A radioactive spider bites him! Miles has no idea what’s happening to him when he has a sudden growth spurt, gets all sweaty, hyper-aware, and has sticky hands and feet. He soon figures it out when he heads back to where he smushed the spider and finds more than he bargained for…the real Spider-Man in a fight against Kingpin and his goons. He discovers Miles is like him, and promises to teach him what he needs to know. Tragically, Peter dies, and the universe is ripped open by Kingpin and Doc Ock’s creation…enter an older, washed up Peter Parker. And then enter 4 more Spider-people/pig…Here’s where things get interesting! None of them are from this universe, and in fact, Kingpin has opened multiple tears. They team up to destroy Kingpin and his machine. And…enough of the plot! 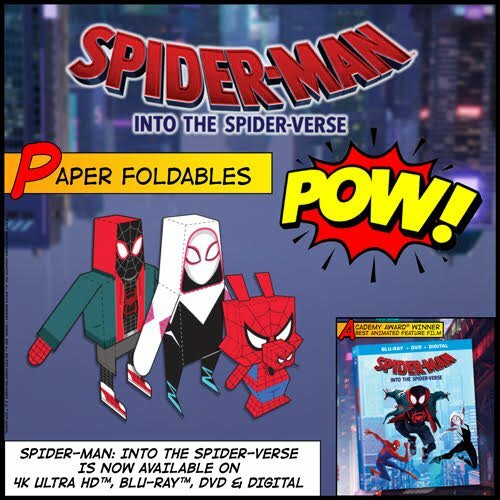 You’ve got to watch SPIDER-MAN: INTO THE SPIDER-VERSE for yourself! I can totally see why it won so many awards. The animation is so unique combining computer animation with hand-drawn animation. It is stunning, and if you are a Spider-Man fan, you’ve got to add this to your collection! So, go out and get it today! In his very own original short, Spider-Ham: Caught In a Ham, fan favorite Spider-Ham defeats his greatest foe, delivers sidesplitting puns, and get sucked into another dimension! It actually can get weirder! Also, don’t miss the thrilling Alternate Universe Mode where fans can view the film in an entirely new way to discover alternate scenes, plotlines, characters, and more with the filmmakers as their guide. Find out more about the bonus content in my post with some very cool Spider-Verse concept art. My family loves this movie… so fabulously done and an amazing movie for sure with a fabulous message. I actually am not a fan of cartoons but loved this! I was so impressed with it!